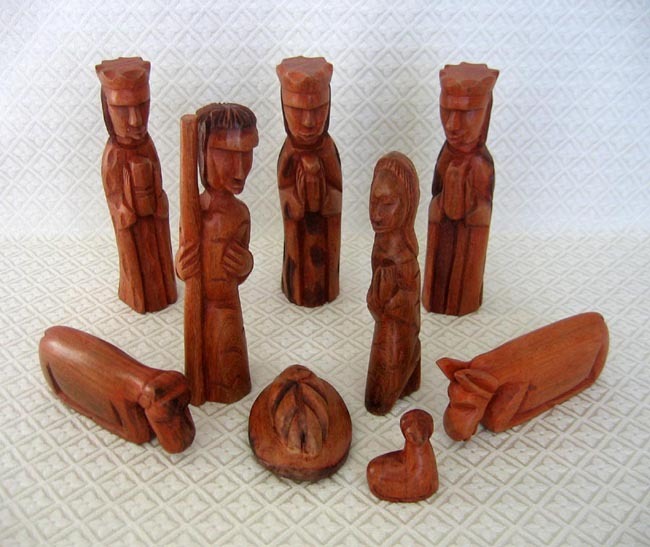 This Nativity set was carved from tweneboa wood by Tommy in Monrovia, Liberia. This wood is the most popular variety used for drums, masks, and carved figurines in Liberia because of its plentiful supply and beautiful wood-grain patterns. Tweneboa (literally translated as “drum wood”) can vary from light to medium-dark brown. This set has been stained with a warm honey-colored polish and black accents. The scene contains the Holy Family, a donkey, a camel, a sheep, and three wise men. The tallest standing figure measures 8 inches tall. Tommy is a 27-year-old Liberian woodcarver from the Bassa ethnic group. He was born with one leg much shorter than the other due to the crippling effects of the polio virus. Tommy refused to limit his life to sitting by the roadside to beg alms like others with disability. He makes a livelihood by carving wood, including Nativity sets, traditional masks, and marriage chains. Tommy graduated high school a few years ago and desires to attend college. Proceeds from his Nativity sales will help him pay his way to college.